Tomorrow is Rory’s fourth birthday. She’s getting a big ole’ pink plastic doll house with a doll family that kind of looks like ours, if you take a lot of liberties with race and stuff and keep in mind that Rory’s skin is really very brown and that the little boy doll’s hair is covered by his hat anyway. And a van for said doll house family. And a game. And some pink plastic furniture. What she’s not getting is a party–and that’s odd, because as a rule there’s nothing we love more than parties, and we usually rock some pretty big ones. But the one friend Rory would really, truly want at her party can’t come, and we’re not going to pretend. Rory’s “Bethany friend” is in China, but we know she’d be here if she could. Right decision? I don’t know. We’ll have a party–there will be balloons and cake and presents. And I think Rory is getting enough of other kids at school and such right now. I think it’s a solid decision, anyway. I want to tell you how normal and regular and loving our day felt. I want to tell how much I’m thinking of Rory’s Mama Deena, who would usually be the one making all those cupcakes. I want to tell you that I’m thinking of Rory’s birth mama, and maybe I am. But it’s late, and it will all have to wait until tomorrow. Happy birthday Rory! Tomorrow (well today since it’s after midnight now) will be my Jess’s 4th birthday as well. 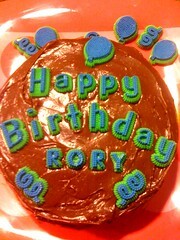 Happy Birthday Rory!!!!!!! Hope you all have a wonderful day!!!!!! BTW, I didn’t think the cake was lame. I thought, “Wow! She managed to make a cake.” That’s where I am in my life right now.